Hartlip Place is a fine Georgian House built in 1812 by William Bland. It has an authentic, family feel and provides an oasis of calm and comfort. It is splendidly proportioned and filled with lovely pictures and antiques. The house faces south, away from the lane to create an atmosphere of peace and seclusion. It is set in four acres of gardens and woodland including a ‘secret’ rose garden and two ornamental ponds. Guests will enjoy the feeling that they are in a real family home - and may have the opportunity to meet the family dogs and cats, as well as the free-range poultry, ducks and peacocks. 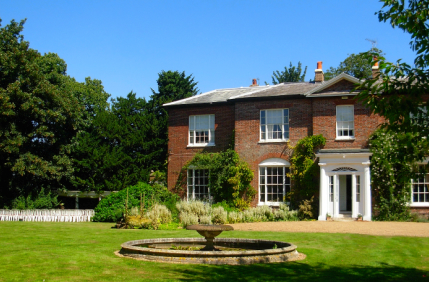 Hartlip Place has offered Bed and Breakfast accommodation for more than ten years and has been licenced for civil ceremonies since 1989 and is also proud to have held one of the first civil partnership ceremonies. Only ½ hour from the Eurostar at Ashford for the Continent, ¾ hour from Gatwick and Channel Ports and 1 hour from London.